The good news for Mac gamers just keeps on getting better: EA DICE Executive Producer Karl Magnus Troedsson says the studio is thinking about making a version of Battlefield: Bad Company 2 for the Mac. It's been a good week to be a Mac gamer. Valve revealed yesterday that a Mac version of Steam is coming next month, along with pretty much the entire Valve catalog, including Left 4 Dead 2, Team Fortress 2, Portal and the Half-Life series. That's some pretty hot stuff, but now it looks like there might be even more fun in store for the future. Writing on his Twitter account, Troedsson applauded Valve's decision to support the platform, saying, "Steam for Mac - Gabe, we like it!" Then, in a later update, he added, "We're currently investigating the possibility of making BFBC2 available on Mac." 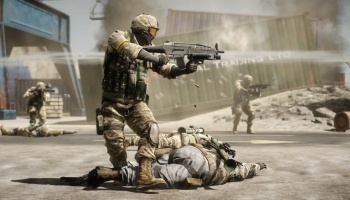 It's not exactly an iron-clad release date, but where Valve goes, others follow, and DICE is no doubt also be thinking about the advantages of bringing the modern warfare bug to the Mac ahead of certain other developers. Did I miss a memo here? Where's all this Mac love coming from? It's only two developers, sure, but that's still two more than usual. If this keeps up, I'm going to be reduced to pointing and laughing at the FreeBSD crowd.